Edward James Mortimer was born in 1886 in Westcott, Surrey. According to the England and Wales birth index, Edward was born in the 3rd quarter of 1886 in the registration district of Dorking. 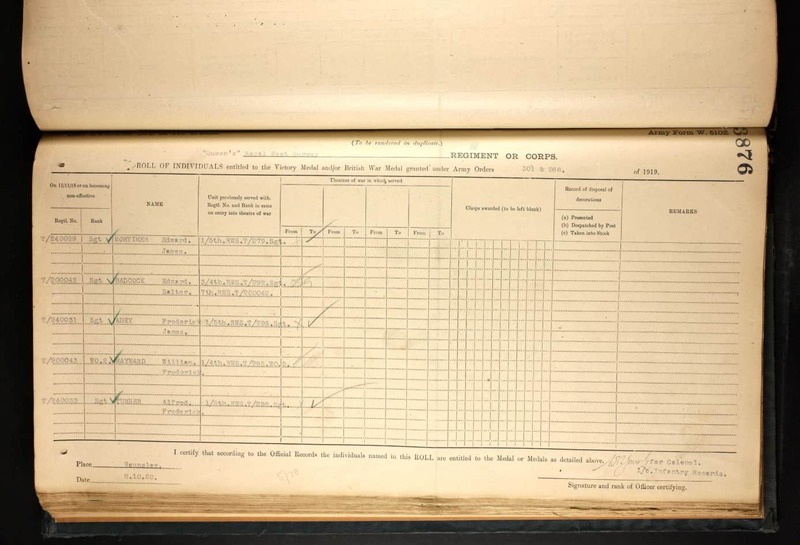 According to the 1894 National School Admission register he was born on the 28th of June 1886; and according to the England Select Births and Christenings, Edward James was born on the 26th of June 1886. Edward’s parents were carpenter James Mortimer and Elizabeth Jane Mortimer nee Doyle. 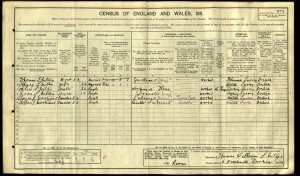 Edward was baptised on the 25th of July 1886 in Westcott, Surrey. Edward’s father James Mortimer was born about 1862 in Coldridge, Devon to carpenter George Mortimer, born about 1834 in Sandford, Devon, and Agnes Mortimer nee Dart born about 1823 in Coldridge, Devon. 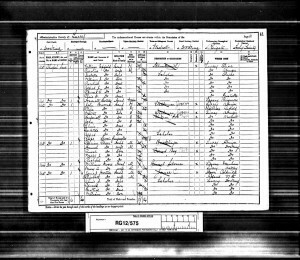 George Mortimer and Agnes Dart married in the 1st quarter of 1857 in the registration district of Crediton, Devon. 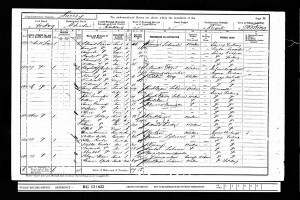 Edward’s mother Elizabeth Jane Doyle was born about 1855 or 1868 in Kingstown, Ireland. James and Elizabeth Jane married in the 4th quarter of 1883 in Guildford, Surrey. 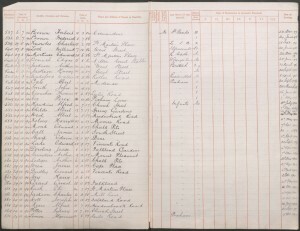 Edward had three known siblings: Annie Jane Mortimer born in the 4th quarter of 1884 in Horsham Sussex; Beatrice Agnes H. Mortimer born, according to the 1893 National School Admission register, on the 14th of January 1889 in Westcott Surrey; and William John (Jack) Mortimer born, according to his enlistment papers, on the 13th of February 1891 in Westcott, Surrey. During the time of the 1891 Census, the family lived at Chapel Lane in Dorking. James was working as a joiner and Elizabeth was looking after their children Annie Jane, Edward, Beatrice Agnes H. and William John. 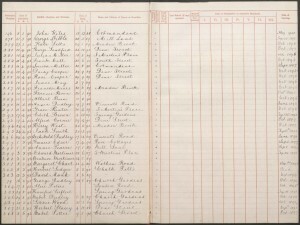 The 1893 National School Admission register reads that Edward and Beatrice Mortimer were admitted on the 3rd of May 1893 to St Martin’s Church of England School in Dorking for infants. At this time the family lived at St Martin’s Place in Dorking. Both children left the school on the 25th of September 1893. 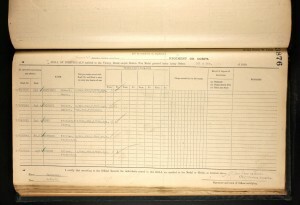 The 1894 National School Admission register reads that Edward was admitted on the 27th of August 1894 into St Martin’ s Church of England School in Dorking for boys. At this time the family still lived at St Martin’s Place in Dorking. He left the school on the 22nd of December 1897. At the time of the 1901 Census, the family lived at 27 Mill Lane in Dorking. Elizabeth Jane was working as a cook and, her children, Annie Jane as a domestic servant, Edward was a butcher’s assistant and Beatrice Agnes H. and William John were at school. 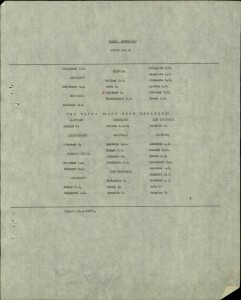 Edward’s sister Beatrice Agnes H. married in the 4th quarter of 1908 either to Edward Taylor or Walter Shepherd in the registration district of Dorking, Surrey. At the time of the 1911 Census, Edward and his brother William John were boarders of jobbing gardener Thomas William Skilton at 6 Brookside in Dorking. Edward was working as a timber labourer and William John as a painter labourer. The accommodation had four rooms. 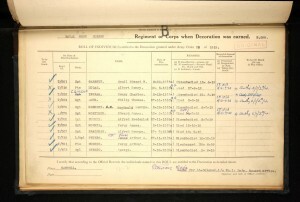 Edward’s brother William John enlisted into the Territorial Army on the 23rd of November 1911 in Dorking for 4 years. He became part of the 5th Battalion the Queen’s Royal West Surrey Regiment. He was appointed a bugler. His regimental numbers were T/1419 and T/240133. At the time of his enlistment William was working as a builder and lived at 6 Brookside in Dorking. William John was 5ft, 7in tall, had brown hair and light eyes. Later he also had a tattoo. At first William was serving at home and after the outbreak of WW1 in India. He was stationed in Bombay, Basra and Bagdad. William John was punished several times during his service in the Army. For example in 1915 he was punished for being absent from Roll Call Parade, disobeying orders: shaving his upper lip and for being absent from playing at Officer’s Mess. 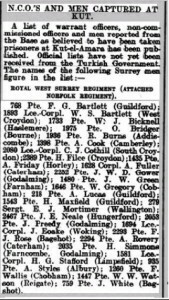 Edward James Mortimer enlisted in Dorking, where he also at the time resided. He became Sergeant and his registration numbers were T/240020 and T/279. He was the part of the 1st/5th Battalion the Queen’s Royal West Surrey Regiment. Edward disembarked on the 12th of May 1915 in the Asiatic Theatre of War. 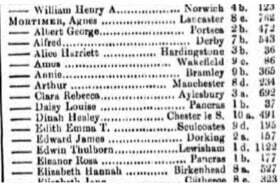 According to the Dorking and Leatherhead Advertiser (24.06.1916) Edward James was reported from the Base, amongst many others, as believed to have been taken prisoner of war at Kut-al-Amara in Mesopotamia. The First Battle of Kut began on the 5th of April 1916, as the final British attempt to relieve the Turkish siege of Sir Charles Townshend’s beleaguered 10,000 troops garrisoned at Kut. Its failure sealed the fate Townshend’s force which, out of supplies, surrendered unconditionally to Turkish commander Khalil Pasha on the 29th of April 1916. Townshend’s failed to purchase parole for his 10,000 men with his offer of £1,000,000. This action is considered as the biggest humiliation of the British Army in its history. 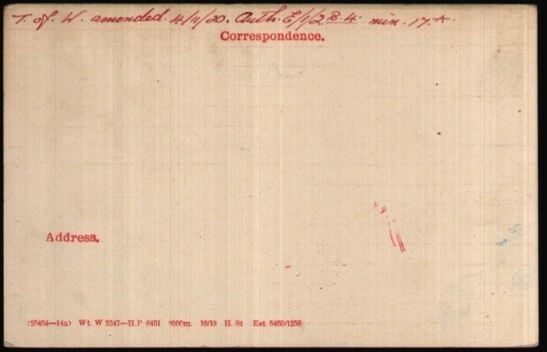 The conditions during the siege were appalling. 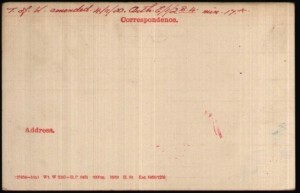 Bitter cold and the lack of medical treatment led to deaths of many soldiers over the winter. Moreover, captured British and Indian soldiers were brutally treated during their march to Turkish POW camps in Anatolia. Of the 11,800 men who left Kut with their captors on the 6th of May 1916, 4,250 died either during the march or in the camps. 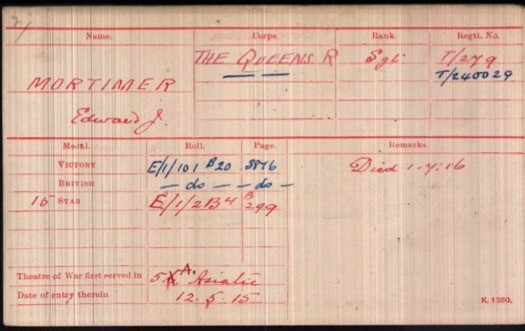 The QRWSR Prisoners Of War book reads that Edward James Mortimer died on the 31st of July 1916 as a Turkish prisoner of war (held at Surrey History Centre at QRWS/1/5/1). Edward James is commemorated at Basra Memorial in today’s Iraq on panel 6. Edward’s father James Mortimer received £69, 18s and 1d in Soldiers’ Effects including War Gratuity of £14. Edward received the British War and Victory medals and the 1915 Star. Edward’s brother William John Mortimer received the British War and Victory Medals, the 1915 Star and the Efficiency Medal. He was discharged from the Army on demobilisation on the 30th of June 1919. 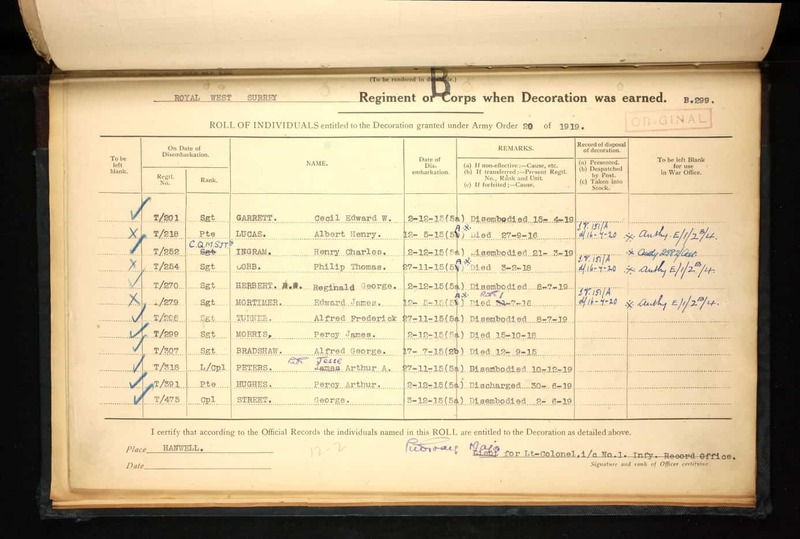 On the 9th of April 1921 he reenlisted in Dorking, Surrey as the part of the 90 days emergency service. At this time he lived at 6 Church Garden in Dorking. 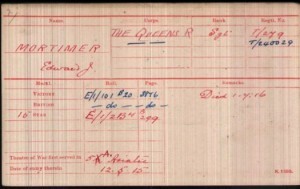 He became again part of the 5th Battalion QRWS Regiment. He was a private. His regimental number was T/240133. He was dispersed on the 4th of July 1921. William John died in 1924 and was buried on the 12th of December 1924 at the Dorking Municipal Cemetery.